I’ve been noting the proliferation of cauliflower rice recipes over the last few years with a watchful, if slightly sceptical eye. I love my starch and this low carb, 5:2 diet food sounded a bit too good to be true. As I am co-hosting the Cool Cauliflower Recipe Collection this month, however, it seemed like the right time to try it out. The idea is to pulse cauliflower in a food processor until it resembles rice or couscous and use it as a substitute for either of those ingredients. It not only resembles them in texture, but is meant to be filling and satisfying too. 100g of cauliflower is 25 calories compared to rice which is 350. Rather than use a food processor, I went with my trusty Optimum 9200 blender, which did a perfectly good job, as long as I didn’t add too much at one time. Amazingly, sceptic that I am, I found the claims to be true. There was a bit of a brassica taste to be sure, but it was quite mild. Frying it in a very small amount of rapeseed oil, gave it a slightly nutty flavour and it went brilliantly with the jerk curry I made to accompany it. Not only did it taste good, but it soaked up the curry sauce well and was perfectly satisfying. I didn’t feel cheated at all. I have been converted to cauliflower rice as a perfectly exceptable substitute for the real thing. My only quibble is that it’s not as easy to prepare. However, given that the calories are significantly less, it’s probably worth the extra effort. Cornish cauliflowers are still in season and I easily found a good looking fresh one at my local greengrocers. I had some organic sweet potatoes in need of using up as well as some rather ropey carrots and sprouting onions. I made a simple Caribbean curry with these and used some flavoursome jerk seasoning from Spice Kitchen and fresh ginger to liven it up. Cooked in coconut milk, the results were quite delicious. A low carbohydrate alternative to rice or couscous, cauliflower works particularly well with curries. The jerk curry is simple and quick to make as well as being quite delicious. 2 tsp tamari soy sauce or 1 tsp rock or sea salt. Remove the outer leaves and biggest part of the stem from the cauliflower and cut the remainder into florets. Pulse in a food processor until the cauliflower resembles rice or couscous - be careful not to over do it as you don't want a paste. Depending on the size of the machine you are using, it may be better to do 1/4 or 1/2 at a time (I used my high speed blender). Dry fry the cumin seeds in a large non-stick frying pan over medium heat for a minute or two. Add the rapeseed oil followed by the cauliflower. Cook for about 5 minutes, turning occasionally to ensure even cooking and no burning. The 'rice' should be golden and cooked, but with a slight bite to it. In a large saucepan, fry the onions in the oil over a low heat for about 10 minutes. Add the jerk seasoning and the carrots and fry for a few more minutes. Add the sweet potatoes and ginger and stir. Add the bean, coconut milk and tamari or salt. Cover and leave to simmer for about 15 minutes or until the carrots and sweet potatoes are soft. Once riced, the cauliflower can be kept covered in the fridge for 2-3 days and cooked as required. I am of course adding this recipe to the Cool Cauliflower Recipe Collection hosted by myself and Karen over at Lavender and Lovage. Please do join in with any cauliflower recipes you have, past or present. The linky is open until the end of the month. This cauliflower rice with jerk sweet potato curry also goes to Jac of Tinned Tomatoes for Meat Free Mondays. Using cauliflower instead of rice makes this yummy curry eligible for Extra Veg which is this month hosted by Kate over at Veggie Desserts. Although I bought the cauliflower fresh, how could I not for such a dish, the rest of the vegetables would have soon be ready for the compost heap and I only just rescued them in time. So I am sending this off to Lucy at Baking Queen for Credit Crunch Munch. Thanks for visiting Tin and Thyme. 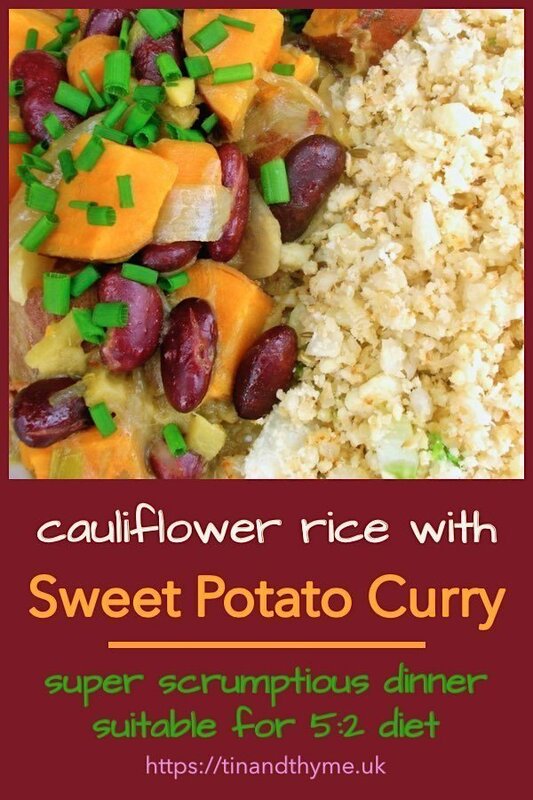 If you make this simple but tasty cauliflower rice with sweet potato curry, I’d love to hear about it in the comments below or via social media. Do share photos on your preferred social media site and use the hashtag #tinandthyme, so I can spot them. For more delicious and nutritious recipes, follow me on Twitter, Facebook, Instagram or Pinterest. As a Froothie Ambassador, I get a commission on the 9200A Optimum blender if you buy it by clicking on any of the links in this post or the sidebar. Buying through a link will not cost you any more, but I will get a small commission. This helps keep Tin and Thyme blythe and blogging. Opinions are, as always, my own. As this is my first cauliflower rice Johanna, I’ve never tried it in a food processor, so don’t know which is better. If you try it, perhaps you could let me know. Love the sound of the Curry but the Cauliflower rice concept isn’t for me. Having tried it I’d rather have the calories for the real thing and use my cauliflower in some other way. So glad you have your priorities right Dannii 😉 What do you use to make your rice? I was a sceptic too, Choclette. It really is quite amazing how good cauliflower rice tastes. Lovely looking curry too. I love a good vegetarian dish and this looks so pretty and sounds so tasty, one to put on the to make list! Thanks Camilla, it was certainly tasty enough for us to enjoy it two nights running and rather wishing we had more. Thanks Kate, it’s funny how such a familiar vegetable can be transformed into something seemingly quite radical. I have not made this yet although I have made cauliflower couscous which I think is pretty much the same thing and I love it. That caulk is a good old girl! This curry looks amazing! Ah yes Karen, you are the cauliflower Queen. I have no idea what a Chinese cauliflower is, so look forward to finding out. This looks and sounds lovely! I’m a big fan of cauliflower rice and sweet potato curry, but have never tried them together – and have never used jerk seasoning. I bet it would give the curry a lovely kick! That sounds like a really interesting and unusual way to eat cauliflower. I’ve been intending to try the cauliflower cous cous for about a year now and still haven’t got round to it! Every time I buy a cauli, my husband uses it before I get a chance!!!! 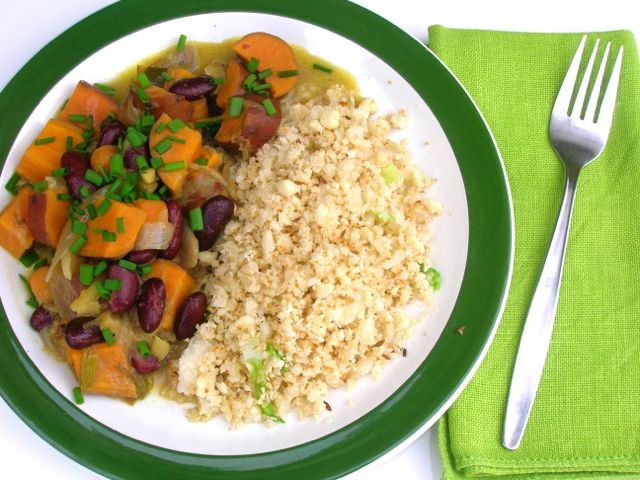 The curry sounds delicious…… Sweet potato is such a great vegetable and I love adding kidney beans…. Ooh lucky you Kate, I wish CT would use cauliflowers before I get a chance. What does he cook with them? I love curry’s as it’s really simple to knock something tasty up quite quickly. My wife persuaded me to try cauliflower “rice” a few months ago and, despite my initial doubts, I enjoyed it a lot. Since then I’ve used it with many other dishes and I’m a convert. This is a very fine combination – definitely my kind of dish. Thanks Phil. It’s funny how we resist these things even though we pride ourselves on being adventurous cooks. I’m glad it wasn’t just me. Haha yes GG, I’ve just been over to see your lovely sweet potato skins. You should try the cauliflower rice and then you’ll know if you think it worth doing again or not. Great post Choclette, I’m still to try this faux rice as I rarely buy cauli’s, but I reckon it would get a thumbs up from me. I also love your new blog Choclette, so much better to navigate and the style really suits you. 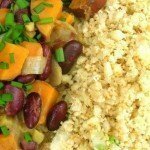 Your recipes are always winners and this sweet potato dish with cauliflower rice sounds very tasty. I love the fact you can replace a carb with a veg without missing out. Such a great invention! Thank you Laura, that’s really kind of you to say and has given my morning a huge boost 🙂 It’s really quite astonishing that we can go on inventing new ways of preparing old foods and this is definitely a good invention. I love cauliflower rice, and it is so easy to make in the froothie. I am all for #ExtraVeg. Thanks for linking up. Thanks Helen, I’m glad I got around to it – eventually! I’m a recent convert to cauliflower rice. I ate it quite a bit while I was slimming (glad to say I reached my target weight, two stone lighter than I was in December!). Gorgeous recipe this! Gosh well done you Elizabeth, your persistence paid off. I know it’s cauliflower rice is great for those wishing to lose weight or on the 5:2 diet, but it’s actually a really nice way of preparing it anyway. I’ve been doing cauliflower rice/couscous for awhile now, and also really love it as roasted florets with turmeric and za’atar too. Your recipe looks so good, Choclette. A beautiful balance of flavours and texture. PS I really like the Spice Kitchen blends. The best I have tasted really. Thanks Kellie. I tried roasting cauliflower with a spiced cocoa blend once. It tasted good, but didn’t look at all pretty. I think your turmeric and za’atar sounds like a goer.